Mallory Caine just wants to live her life quietly, at least as quiet as a lawyer in L.A. can. Being hit on by lascivious judges, pursued by an ex-boyfriend and having a killer roaming the streets is not helping in that department. But then, neither is being a zombie. Mallory Caine died about a year ago, but was brought back to life by some unknown person and now survives as a zombie in the Hollywood Hills. Her own murder (not that anyone knows that was what it was) is unsolved and now she discovers that someone is killing zombies. Zombies do not have souls, and if Mallory is killed (again) before she gets her soul back she will end up in Hell. On top of all this is a new case from a woman who proclaims she is innocent of murder, and Mallory has first-hand knowledge her client is telling the truth. 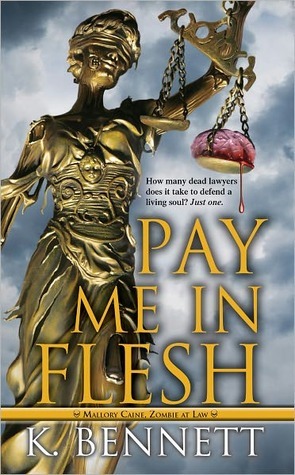 There is a lot thrown at the reader in Pay Me In Flesh, first in a new series by K. Bennett, but nothing that really confuses the story line or set up for the next book. Everything is introduced by Mallory matter-of-factly. She has been "living" as a zombie for a year, and knows that while not all of her decisions would be considered morally acceptable, she will do what she has to survive. Survive she must, not only against the zombie killer roaming the streets, but trying to navigate a life with bills to pay, an ex-boyfriend intent on reigniting their relationship and the continuing mystery of her own resurrection. Bennett has started a fun series with a lead character who does not apologize for who she is; even when she eats their brains. What You Can Find Here..
Armchair BEA: Who Am I?